Pike'nBass Float Tube Rod Holder 4Rod, easily take up to 4 spare rods when belly boat fishing! Fishdeal.co.ukPike'nBass Float Tube Rod Holder 4Rod, easily take up to 4 spare rods when belly boat fishing! Always have enough rods with you for different applications! This rod holder can quickly and easily be attached to your belly boat with two carabiners. The rod holder can hold up to 4 rods. 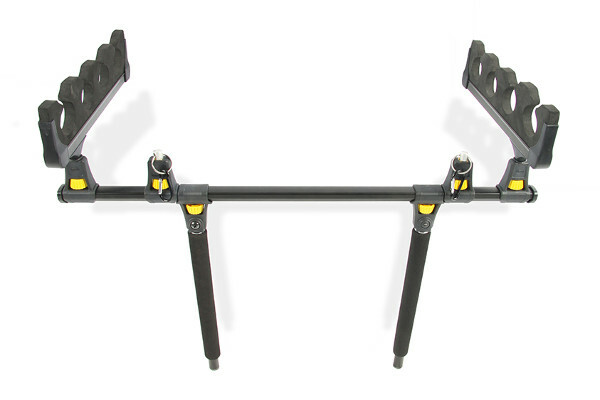 The rod holder is mounted behind the back to ensure your spare rods do not hinder you when fishing! The perfect solution for belly boat anglers who like to use different techniques!